The Gili islands are a must-visit for any traveller to Bali. They’ve become so popular with tourists, and even Bali expats, that the islands barely feel the pinch of the low season these days. Which means rooms fill up fast, especially in the mid-budget range. Even if you do manage to book Gili island accommodation online, you never really know what you’re going to get. Especially when only one tiny low-res photo appears in the listing. 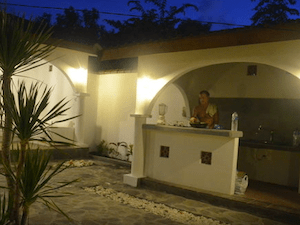 Finding Gili island accommodation on the fly is easier in Gili Trawangan than Gili Meno and Gili Air.But negotiating a good deal won’t be easy if the islands are busy. 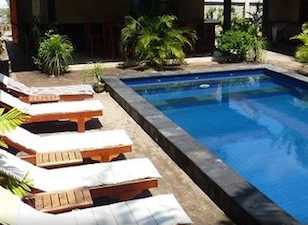 When it comes to finding a good place to stay in the Gili islands, it pays to come prepared. Looking for sweet deals on decent Gili island accommodation can be a little tricky, even in the digital age. Budget and mid-range villas and beach bungalows mainly rely on the walk-in crowd for business. But a few Internet savvy owners are now listing their rooms on AirBnB.com, along with a great selection of true-to-life photos, so you know exactly what you’re going to get. Thank the travel Gods for AirBnB – it’s not the first time we’ve taken to this fabulous new holiday rentals website to find neat Gili island accommodation deals. 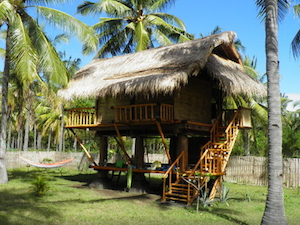 On the hunt for a great deal on Gili island accommodation? We’ve got you covered. 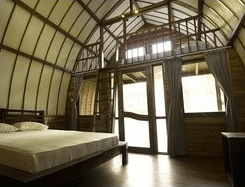 You’ll adore these 8 AirBnB island stays for under $75 a night, especially the luxury eco tent resort on Gili Trawangan.. Right beside Sunset Beach where the bars are laid back and eating at small warungs is easy, lies a cluster of reclaimed wood bungalows, nestled in a grove of coconut trees. With breathtaking views over the watery horizon and the sun setting over Mount Agung, you’ll feel a world away from Gili Trawangan’s thumping nightlife. Yet still have the option to check out the scene. Villa Bambu’s three bungalows are comfortably appointed with pretty décor, fresh water and outdoor bathrooms. It’s the perfect quintessential Gili Trawangan island stay. Conscious of your holiday carbon footprint? 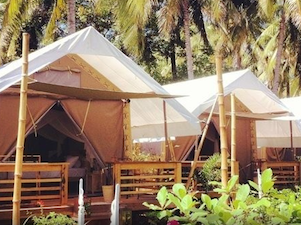 La Cocoteraie Ecolodge is an eco-chic luxury tent resort, secluded on the quiet north side of Gili Trawangan. It’s the perfect place to escape the crowds and have an elegant, exotic camping experience (at a fantastic rate). You’ll sleep like a log in this serene setting, so close to nature – and so will the kids. 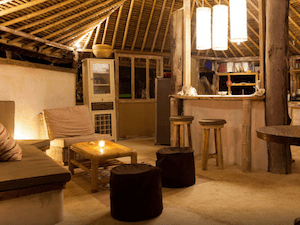 This spot gets our vote for most unique place to stay on Gili Trawangan. And at US$71 a night, it’s a real steal. 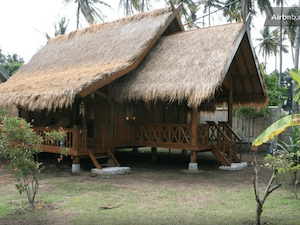 A lovely garden resort with five traditional wooden lumbung bungalows, is just a10 minute walk from the beach, and close to Gili Trawangan’s main strip. It’s a great sleep for US$38 as you’ll pay double that on the main strip for something similar. Amenities include fresh water showers, air-conditioning and WiFi – that’s all you need on the island, at a very pocket-friendly rate. Accommodation in Gili Meno for around US$50 a night doesn’t get any better than this. This relaxing resort is a great place to unwind, practice yoga and contemplate the meaning of life. The terrace bungalows are built in the traditional Sasak style and comfortably appointed with recycled teak beds and a semi outdoor showers. Fresh water showers are available for a small additional fee. There’s also a juice bar and raw food cuisine, so you’ll feel well and eat well too on the paradise island. Tucked away in a tropical coconut grove on the north side of Gili Meno, just 5 minutes from the beach, Divine Divers dive centre and Sunset Gecko are two exotic lumbung style bungalows. However, below the US$40 mark one doesn’t expect a fresh water shower. Nevertheless, a great island stay, not to mention budget-friendly accommodation for the Robinson Crusoe castaway traveller. This newly-built modern hotel on Gili Air has a swimming pool and a restaurant, making it a great option for families. It’s five air-conditioned rooms are appointed with quality interiors, outdoor bathrooms and private terraces with views over the pool (so you can keep your eye on the kids). These charming villas are located on the west coast of Gili Air, with captivating sunset views over Mount Agung – you’ll have plenty of picture perfect family moments here. Can’t afford a holiday in Spain? This romantic Spanish style finca house is the next best thing (if not better). Located a short 3 minute walk from the beach in Gili Air with 5-star amenities, it’s an idyllic spot for guests who prefer privacy and don’t need to be fussed over. Santay Villa sleeps four and is perfect for families and groups travelling together.The traditional wooden bungalow is located just 100 meters from the beach, and features a big balcony and private garden, for relaxing evenings and star gazing. What it lacks in service, it makes up for in privacy and a big slice of peaceful island life in Gili Air.